Swansea University is blessed with a wealth of habitats, from the beach and dunes of the Bay to the woodland and gardens of Singleton. These habitats are home to a rich variety of wildlife and provide the University with a wonderful resource, whether for teaching the next generation of ecologists vital skills and giving opportunities for research, or simply a healthy and relaxing environment for staff, students and local residents to recharge their batteries. The Singleton Campus is regularly visited by iconic animals such as otters, polecats and kingfishers, there is a resident peregrine falcon and bats roost in the Abbey buildings. The University is also responsible for the last remaining wilderness of the Swansea Bay coast – the 600 acres of sand dune, saltmarsh and beach of Crymlyn Burrows Site of Special Scientific Interest next door to the new Bay Campus and both campuses are open for everyone to enjoy. At the heart of protecting and encouraging wildlife at the University is the Biodiversity Action Plan (BAP). 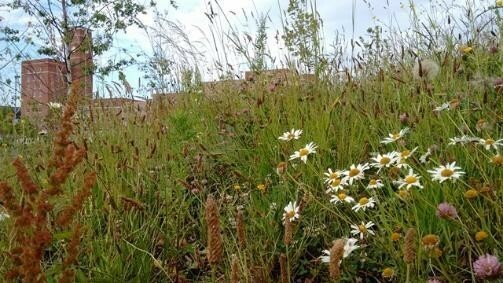 Under the first version of the BAP, produced in 2012, the University has undertaken significant work to enhance and promote biodiversity across its sites. They include embedding wildlife gardening techniques in the way we look after our grounds – leaving rough uncultivated areas, reducing mowing in areas of flower-rich grassland to let plants set seed, creating log piles for invertebrates and fungi and using home-produced compost as a mulch to reduce the use of pesticides; nest boxes and bug hotels have been put up around the campus, and a Nature Trail established (which was launched by the naturalist and TV presenter Iolo Williams). During the summer of 2016 the BAP has had a complete rewrite, bringing it up to date and reflecting the fact that we now have two campuses to look after – key points include identifying suitable areas to create new wildlife habitats; giving everyone the opportunity to be learn about the wildlife we share our University with and the chance to get involved with conservation, and ensuring that development of the University takes nature into account so that year on year we will see an increase in our wildlife. Read the new action plan here.